When an individual or a business incurs either a casualty or theft loss, questions often arise as to the deductibility of the loss, on their tax return. A casualty loss occurs when property is damaged, destroyed, or lost from any unexpected or sudden event, such as a fire or hurriane. A casualty loss does not occur where there is normal wear and tear on the property. The deductible amount of a casualty or theft loss is determined by comparing two calculated amounts. In the first calculation, you must subtract from the adjusted tax basis (cost less depreciation) of the property, the amount of all insurance reimbursements that are received. In the second calculation you must subtract the amount of the fair market value (if any) after the casualty or theft from its fair market value before the casualty or theft. The lesser of the two calculated amounts is your casualty or theft amount. However, if the loss is related to personal use (non-business) property, there is yet another calculation that has to be made before you can determine if the casualty or theft loss is deductible. In this calculation you must subtract $100 from the casualty or theft amount, as determined from the first and second calculations described above and then you can only deduct the result in excess of 2% of your adjusted gross income. For example, if you had a $10,000 casualty or theft loss and had $100,000 of adjusted gross income, you would have no deductible casualty loss, because $10,000 minus a deductible of $100 is $9,900 and 10% of $100,000 is $10,000, which is more than the $9,900 casualty loss amount. This is why most personal use casualty and theft losses are not deductible. However, in recent years, there have been very large casualty and theft losses resulting from incidents such as Ponzi scheme theft losses (Madoff) and from casulty losses (Hurricane Sandy). 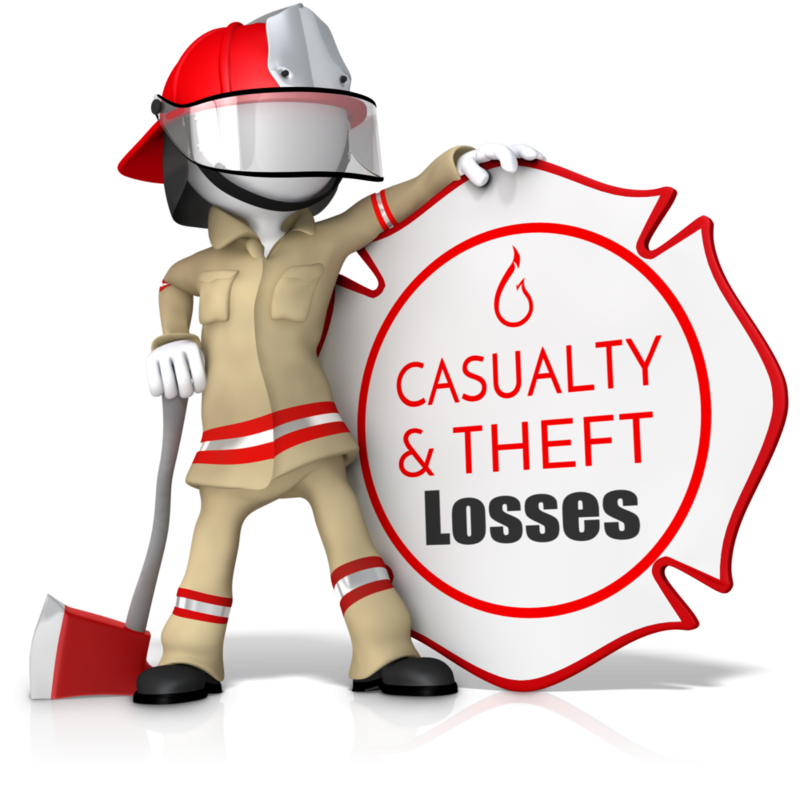 If your casualty or theft loss results in a net operating loss (for individuals, this can happen when they have both a large casualty/theft deduction and negative taxable income). Individuals can carry back that net operating loss three years and apply those losses against the prior tax years’ taxable income to get Federal tax refunds. Any remaining net operating losses that are not used up during the 3 year carryback is available to be carried forward. Casulty losses that occur in a later determined federally declaired disaster area sometimes provide additional tax benefits. If you encounter a situation where you may have a casualty or theft loss, you should consult with an experienced tax professional as to how to maximize your Federal income tax deductions from these types of losses. Our firm is well positioned to help you deal with these issues. If you have any questions about casualty or theft losses, please contact us at or 908-782-7900.